20 Ways To Lose Weight Fast & Rapid Fat Loss – The Official Website of Masters of Money, LLC. Before jumping into a diet, you must determine your ideal weight. This will be your guide on your weight loss journey. Fast weight loss doesn’t imply that you drop 50 pounds overnight; a few pounds can take months to shed and for obese individuals, it can take years to lose the desired amount of weight. How fast you lose weight will depend on how focused you are on your diet. 1. Before dieting, you must know how many calories you normally need in a day. If you are sedentary, multiply your weight (in pounds) by fifteen. If you are moderately active, multiply your weight by seventeen; if you are active, multiply your weight by twenty. This will give you the average calorie intake you need per day. 2. Remember to eat your fruits and veggies! You need at least five servings of them per day doing this will put you on the right track to a healthy body, because fruits and vegetables have beneficial fibers, vitamins and antioxidants. They also fill up your stomach fast so that you don’t overeat and take into many calories. 3. Monitor the quantity of food you eat. Avoid high-calorie foods and eat in small portions. A helpful tip is to chew your food slowly because this makes digestion easy on your body and you will also be less likely to overeat. 4. Don’t skip meals. When you want to lose weight, it may be tempting to starve yourself ñ but eating small amounts of food frequently can help you maintain a healthy, balanced calorie intake throughout the day. Also, your blood sugar level will be adversely affected if you don’t eat often. You can even divide the standard allotment of three meals into five or six smaller meals. 5. Fresh fruits and vegetables are ideal. Packaged and processed foods have high sodium and fat content. You are more likely to lose weight if you eat naturally fresh foods. 6. Don’t limit your food intake too much. Go ahead and indulge yourself; eat your favorite treat. It’s okay to have that slice of birthday cake at the occasional party. Just make sure to eat in moderation and use those special desserts as rewards, instead of enemies, to your weight loss experience. 7. Don’t always believe everything you read on a food label. Fat free does not necessarily mean low calories. The same wisdom goes for foods that boast low sugar or low carbs. Glance over the nutrition label there you’ll find the calorie count. 8. Limit the number of juices and sugary beverages you drink. Instead, drink eight glasses water a day this flushes out your body’s toxins and waste. 9. If possible, keep a food journal. This will help you keep track of your calorie intake and will be a daily reminder of the types of foods you need. 10. Don’t forget to exercise! Thirty to sixty minutes of physical activity a day will ensure your health and help you lose weight (and not to mention, firm up those muscles). Weight-bearing exercises are especially great ways to burn those pesky calories. Are you looking for that jump start to rev your fat loss and metabolism and get you bathing suit ready? The following ten tips will improve your workouts and ignite your metabolism. 1. Most of your workouts should be composed of free-weight or cable exercises. Compared to machines, free-weight and cable movements often require more skill, create muscular balance, and have a greater metabolic cost. For example, it is more difficult to balance the weights, and to coordinate muscles when performing free-weight exercises. Although this may sound like a disadvantage, it is a benefit. By balancing and stabilizing free-weights or cables you are working more muscles through a greater range of motion resulting in more muscles developed and more calories burned. When focusing on improving body composition, you can’t worry about detail exercises, so you should use exercises that’ll get you the biggest bang for your buck. Isolation exercises can be used at the end of a workout to work on a specific weakness, but only do the bare minimum. Perform either non-competing muscle group training or antagonist training. Non-competing muscle group training would involve doing a set of a lower body exercise and following it up with an upper body exercise Antagonist training is executed by alternating exercises that target opposing muscle groups (e.g. chest and back). The list of benefits includes: quicker recovery, greater strength levels and shorter workout times. Through research, it has been determined that the best range for hypertrophy (muscle gain) is roughly between 8-12 reps. Since the focus of your resistance training efforts is to gain lean body mass and stimulate your metabolism, this rep range fills the bill perfectly. 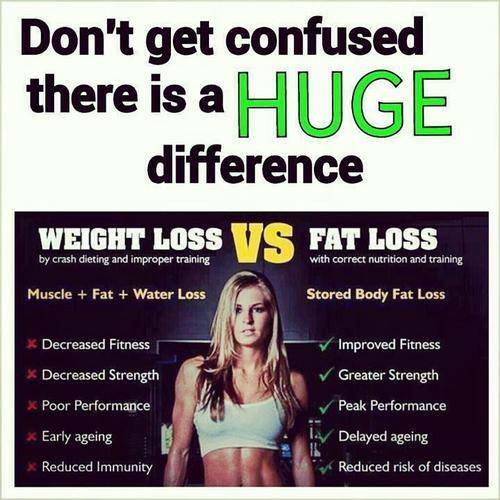 high reps for tone and fat loss is the big kahuna of all training myths! Somehow the aerobics, yoga and Pilates community have convinced us that when we perform body-weight exercises or light resistance training for high reps, our muscles magically take on a beautiful shape without growing or bulging. On the other hand, if you challenge yourself with moderately heavy weights, your body will take on a bulky, unflattering appearance. If you believe this, you probably still believe in the Tooth Fairy! If your first movement in an upper/lower body superset is squats, you might want to rest 60 seconds before attempting your second movement. However, if your first exercise is a fairly “easy” exercise, like let pull downs, you might only wish to wait 30 seconds before doing the second part of the superset. It’s imperative to base your exercise selection around compound, multi-joint exercises. Seventy-five percent (75%) of your exercises for each session must be compound exercises. Six single-joint isolation exercises are not going do the trick. Sure, you can perform a few isolation exercises, but most of your exercise choices should be multi-joint. Cardiovascular exercise aids in the creation of a caloric deficit, but the caloric expenditure during cardio is temporary. Strength training addresses the core of the problem by permanently increasing the rate at which the body burns calories by adding muscle. The best programs will include both strength training and cardiovascular training. Once your blood sugar is used up, the only remaining source of fuel your body must continue with your cardio exercise is your stored body fat. Performing your cardio in this interval fashion will allow you to burn more fat and calories in less time than just keeping a nice steady pace. This will increase the results you see while reducing your time on the treadmill, stationary bike, or whatever form of cardiovascular training you do.